Premium Quality Ingredients. Artfully Arranged. Prepared Fresh to Order. Great for the home or office. Order yours today – you’ll thank yourself later. Whether it be a cheese, meat, sandwich or vegetable platter you can count on getting only the freshest ingredients and prime cuts of meat; simply fill in the form below and click “submit”. Please be advised that we require 24 hours notice on all deli platter orders. If you wish to customize your own platter, we’ll be happy to try and accommodate you. All trays should be kept refrigerated until serving. Photos are for illustrative purposes only and platters may not appear exactly as shown in the picture or in the brochure. GST will be added to items at the time of purchase. Prices are subject to change without notice. Please note that all Deli Platter orders must be picked up from the store. 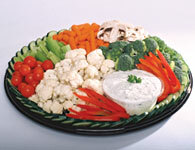 An array of crisp, colourful raw vegetables served with your choice of ranch or dill dip. Garden fresh selections include carrots, celery, cucumber, cherry tomatoes, broccoli, cauliflower and mushrooms. Tasty bite-sized wrap portions make a winning display and are fun to eat. Soft tortillas with cream cheese spread, layered with slices of roast beef, turkey, corned beef, ham or chicken then topped with lettuce and cheddar cheese. Great for kids! A tangy accompaniment to our High Roller or Sandwich Stack trays. Assorted dill pickles, Sicilian olives, cocktail onions, stuffed and assorted imported olives. All your favourites piled high including egg salad, salmon, roast beef, turkey, ham, corned beef and chicken. Made with fresh baked whole-wheat and white bread. Crusts can be remove upon request. A pairing of our finest meats and cheeses to please the whole crowd. Slices of roast beef, chicken breast, beer sausage, and ham along with Canadian edam, Canadian medium cheddar, Swiss emmental and your choice of flavoured Canadian havarti. Ideal combined with our cracker tray. Quality sliced deli meats ideal for building sandwiches or snacking. Layers of European salami, sundried tomato turkey breast, roast beef, chicken and your choice of black forest or pepper ham. Served with a dish of crunch pickles or olives. Hit a homerun when you serve this snack platter at the next big game. Cubed portions of garlic sausage, pepperoni, European salami, Canadian Havarti and Canadian aged white cheddar served with mustard dip and a dish of pickles and olives. What cheese or meat platter would be complete without crackers to build on? We’ll arrange a variety of the most popular crackers from our deli. A perfect complement to our C’est Cheese or Crowd Pleaser trays. The perfect pairing of sweet and savoury. 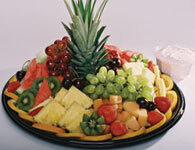 Imported French brie, Dutch smoked gouda, goat cheese and French boursin surrounded by fresh seasonal fruit pieces. Served with our popular red pepper jelly.